Is Pea Protein The New ‘It’ Ingredient Replacing Soy? Pea protein has far less controversy surrounding its production, health impacts, and genetic modification. It is also hypoallergenic, and easily digestible for most. From cereals to smoothies to energy bars, pea protein is everywhere. What’s driving the craze is the hunger to find an easy-to-digest plant-based protein that is less apt to cause allergic reactions, like gluten or soy. Yet, they say the downside to pea protein: it’s not a complete protein, it does not have all the amino acids we need that our bodies can’t make. We got this one! Finally the downside has been proven wrong. Introducing the first ‘Compealete’ Pea Protein with all the amino acids with a whopping 85% protein. Coming early 2019 offering non-GMO pea 85% protein powders manufactured in the USA, procuring yellow peas from North America. Soy has met its match among other benefits about this pea protein this makes a solid statement no downsides, its got all amino acids, low sodium, non-GMO, non gluten, low viscosity and neutral taste. What Makes Soy Such a Risky Food to Eat? Here is a summary of soy’s most glaring problems. 91 percent of soy grown in the US is genetically modified (GM). The genetic modification is done to impart resistance to the toxic herbicide Roundup. While this is meant to increase farming efficiency and provide you with less expensive soy, the downside is that your soy is loaded with this toxic pesticide. The plants also contain genes from bacteria that produce a protein that has never been part of the human food supply. GM soy has been linked to an increase in allergies. Disturbingly, the only published human feeding study on GM foods ever conducted verified that the gene inserted into GM soy transfers into the DNA of our gut bacteria and continues to function. This means that years after you stop eating GM soy, you may still have a potentially allergenic protein continuously being produced in your intestines. Soy foods contain anti-nutritional factors such as saponins, soyatoxin, phytates, protease inhibitors, oxalates, goitrogens and estrogens. Some of these factors interfere with the enzymes you need to digest protein. While a small amount of anti-nutrients would not likely cause a problem, the amount of soy that many Americans are now eating is extremely high. Hemagglutinin is a clot-promoting substance that causes your red blood cells to clump together. These clumped cells are unable to properly absorb and distribute oxygen to your tissues. Goitrogens are substances that block the synthesis of thyroid hormones and interfere with iodine metabolism, thereby interfering with your thyroid function. Phytates (phytic acid) bind to metal ions, preventing the absorption of certain minerals, including calcium, magnesium, iron, and zinc — all of which are co-factors for optimal biochemistry in your body. This is particularly problematic for vegetarians, because eating meat reduces the mineral-blocking effects of these phytates (so it is helpful—if you do eat soy—to also eat meat). Soy is loaded with the isoflavones genistein and daidzein. Drinking even two glasses of soymilk daily for one month provides enough of these compounds to alter your menstrual cycle. Although the FDA regulates estrogen-containing products, no warnings exist on soy. Soy has toxic levels of aluminum and manganese. Soybeans are processed (by acid washing) in aluminum tanks, which can leach high levels of aluminum into the final soy product. Soy formula has up to 80 times higher manganese than is found in human breast milk. Soy infant formula puts your baby’s health at risk. Nearly 20 percent of U.S. infants are now fed soy formula, but the estrogens in soy can irreversibly harm your baby’s sexual development and reproductive health. Infants fed soy formula take in an estimated five birth control pills’ worth of estrogen every day. Infants fed soy formula have up to 20,000 times the amount of estrogen in circulation as those fed other formulas! There is also the issue of pesticides and genetic modification. Soy foods are both heavily sprayed with pesticides and genetically modified (GM). More than 80 percent of the soy grown in the United States is GM. And more than 90 percent of American soy crops are GM.5 Since the introduction of GM foods in 1996, we’ve had an upsurge in low birth weight babies, infertility, and other problems in the U.S. population, and animal studies thus far have shown devastating effects from consuming GM soy. You may want to steer clear of soy products for no other reason than a commitment to avoiding GM foods… unless you wish to be a lab animal for this massive uncontrolled experiment by the biotech industry. 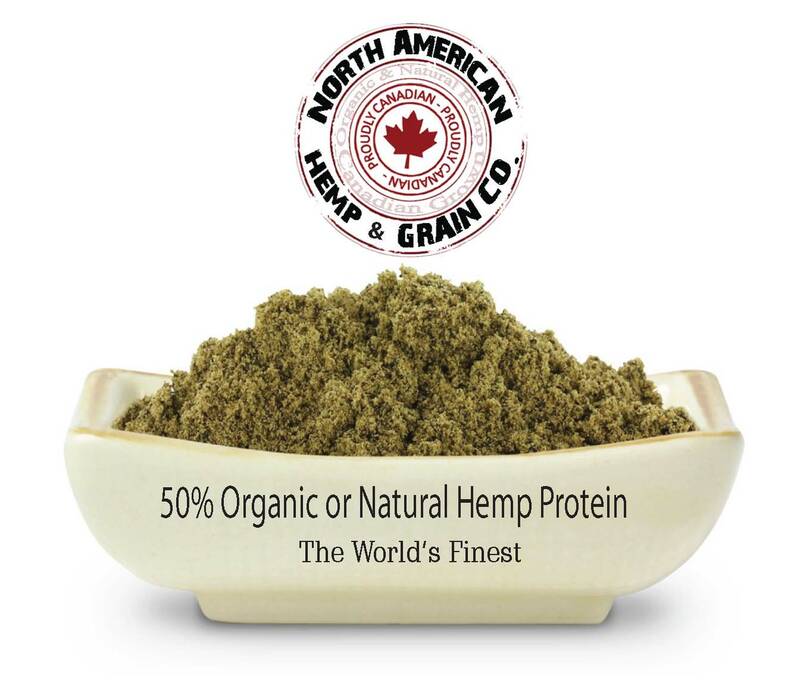 North American Hemp & Grain Co. Ltd Specializing in contract manufacturing Hemp & Other Plant-Based Ingredients Both Dry & Liquid Processing. Want to make a difference, inquire today about our non-GMO Pea Protein the first complete amino acid pea protein coming soon. Availability: Our hemp protein powders are available in bulk wholesale quantities; we offer a range from hemp 50% and 70% protein. All our proteins are done on custom ordering with minimum order quantity. Hemp Protein Powder can supply any diet with a vegetarian source of essential fatty acids, antioxidants, vitamins, minerals, fibre, chlorophyll and a complete, balanced gluten-free source of the essential amino acids. Many plant proteins are labelled “incomplete” proteins as a resulting from the low amounts of one or more of the nine essential amino acids. Truth be told, the “incomplete” label is somewhat misleading as all plant proteins do contain each of the essential amino acids. But in most cases (e.g. grains, legumes), levels of one or more amino acid are insufficient for human needs. However, hemp protein supplies enough of each of the essential amino acids to contribute to the human body’s requirements. In fact, an important aspect of hemp protein is that it is a quality source of the amino acids arginine and histidine, both of which are important for growth during childhood, and of the sulphur-containing amino acids methionine and cysteine, both of which are needed in the production of vital enzymes. Our bodies can synthesize 16 of the 23 amino acids that we need. That leaves 8 essential amino acids (9 for children), which must come from the foods we eat. Hemp protein also contains relatively high levels of the branched-chain amino acids that are crucial in the repair and growth of lean body mass, making a hemp protein shake after a workout a worthwhile investment. ALL plant-based foods have varying amounts of protein (plus carbohydrates, fats and other good things), and the body will combine proteins from all sources, to make ‘complete protein’. That’s true for everybody, veg or non-veg. The term ‘complete protein’ means that all eight essential amino acids are present in the correct proportion. Foods from animal sources have complete proteins Some foods from the plant kingdom, such as hemp and quinoa, have complete protein. The term ‘incomplete protein’ refers to foods which have all the essential amino acids, but are low in one or more of them. That’s called the ‘limiting amino acid’. Most plant foods have one or more limiting amino acids which limit the availability of all the other amino acids in the food. That’s why these foods are called ‘incomplete proteins’. For example, the limiting amino acid in grains is usually lysine (Lys); in legumes it can be methionine (Met) and tryptophan (Trp). So, the low-level of Lys in grains is complemented by a higher level in legumes, and vice versa, to make ‘complete protein’. However, vegetarians and vegans don’t need to worry about complete and incomplete protein. It is NOT NECESSARY for vegetarians and vegans to combine specific protein foods at one sitting to make complete protein. The global protein market is expected to reach $24.5 billion in 2015, with the greatest annual growth occurring in the plant-protein ingredient sector. From pea protein to hemp proteins, an ever increasing number of plant-based protein sources are being introduced into the marketplace that offer quality nutrition, taste and sustainability at the same time. Given consumer desires to moderate animal-based protein consumption combined with environmental concerns, the use of plant-based proteins offers a viable alternative across multiple existing and new product categories alike. What’s more, protein is the powerhouse macronutrient that research suggests is the most filling when it comes to satisfying hunger, which is particularly important within the context of the global obesity epidemic. Taken together, formulating and marketing foods and beverages that leverage plant-based proteins presents an opportunity for global growth on trend with health, taste, sustainability and consumer demand. High interest in protein content and high-protein lines across the food and drinks market is continuing to develop, despite the fact that most European and North American consumers already get enough protein in their diets. According to Innova Market Insights, the protein trend is driven by increasing health concerns— primarily weight management—plus the move of sports and performance products into the mainstream and targeted at the more generally active, rather than just athletes and sportsmen. Also keeping protein in vogue is the rise is the Paleo diet, which focuses on lean protein, while avoiding processed foods and sugars. “Proteins have diverse application potential, with opportunities for alternative vegetarian options, and new protein sources, such as microalgae, alongside existing and novel dairy-based and vegetable sources, such as soy, beans and grains,” Williams said. Innova Market Insights data indicate that nearly 3% of global food and beverage launches in the 12 months ending March, 31, 2014, were marketed on a “high-protein” or “source-of-protein” positioning, rising to 6% in the United States. DEALERS AND DISTRIBUTORS WANTED – PLANT-BASED PROTEIN SUPPLIERS TO MEET YOUR DEMAND. Our products ranging from: hemp, flax, quinoa, sunflower, chia, pea proteins and several more are currently under way for commercialization. GLA (gamma linolenic acid) is a plant-derived omega-6 most abundant in hemp seeds, although a member of the omega-6 family, it’s metabolized differently than other omega-6s. Our modern Western diet is rife with omega-6 fats and generally deficient in omega-3 fats, a fatal imbalance that sets in motion the inflammatory processes implicated in diseases of aging. GLA can counteract this acquired enzyme defect, supplying vital biochemical precursors with powerful anti-inflammatory effects. By converting into beneficial prostaglandins (PGE1s), GLA compensates for this deficiency. The results can be a profound reduction in the impact of inflammation on cardiovascular disease, lung function, autoimmune conditions, and metabolic abnormalities including diabetes. FACT: Research has found that a deficiency in the Omega-6 essential fatty acid, Gamma Linoleic Acid (GLA), can actually inhibit healthy weight loss and weight control. In fact, recent studies suggest that obesity is linked with low levels of GLA. GLA assists in weight loss by significantly increasing metabolism and encouraging stored fat to effectively be used for energy. GLA activates brown adipose tissue (BAT), which is an active tissue that burns calories for heat. When BAT is actively functioning, it acts as a powerful mechanism for weight loss and weight control. Studies report that BAT is less active in people who are overweight. In addition, GLA also activates the metabolic process through its role in providing the nutrients necessary to control the sodium potassium pump in each cell of the body. The sodium potassium pump is essential for cellular homeostasis, and when it’s functioning properly, it can use up to 20-50% of daily caloric energy. Thus, if the pump is not working effectively, the body will store this unused energy as fat. As important as GLA is for an effective weight management, the challenge is that it only occurs in a very small number of foods in nature. As its name implies, it’s an essential fatty acid, meaning that it must be obtained from the diet. I recommend hemp as the best source of GLA due to it’s easy to assimilate and naturally balanced profile of essential fatty acids. Industrial Hemp’s Diversity Fits In With Key Sectors In The Analysis LOHAS Marketplace $209 Billion Strong 2015 The Year of Hemp! It’s Growing Even Greener…Hemp Branding for today’s Green Revolution! Every where you look these days you will see “Green” products and “Green” programming. There are “Green” cookbooks, “Green” clothing and even “Green” pet products. We have even seen “Green” toys for children. But what does it mean to be “Green”? Going “Green” to most people means being more environmentally responsible and making better, healthier choices for yourself, your family and our environment. Some might worry that they have to make drastic changes in their lifestyles in order to be “Green”. Others might see this as just a fad and a passing trend. The terminology we really do not feel it will be a passing fad, due to the entire whole concept of being more socially responsible and making better choices is here to stay. There are many little things you can do to make an impact on our environment. Maybe not individually, but as a whole society those little things add up to big changes. Our marketing & sales arm in Vancouver Canada; The Hemp Out Agency focuses on a wider environmental consciousness, by collectively marketing ‘hemp out’ of an alternative culture and into the mainstream. Hemp itself is a misunderstood little plant, not just for certain dubious members of society; it is a remarkably versatile substance, protective properties, feeds our planet, and supports sustainability. Hemp Out is a social movement that views people’s social behaviour around natural food trends, growing green initiatives, and Hemp Food’s popularity in the marketplace. Personal Health, a broad category that encompasses natural and organic foods, dietary supplements, natural and organic personal care products, integrative healthcare, and mind/body/spirit products and services comprises more than half of all LOHAS marketplace sales, for a total market value of $118 billion. Its size indicates its position as the cornerstone of this marketplace: Most consumers enter the LOHAS marketplace through a “consumable” product, simply because such products are readily available and their cost is relatively low (compared to durable goods, such as a hybrid vehicle). Furthermore, these products have been in-market many years and consequently have high consumer awareness and familiarity. 1. Natural and organic foods, contributing just over 20 percent of this sector’s value. Purchases are split almost evenly between organic and natural foods and beverages, with a relatively small increment coming from foodservice. The fact that organic sales eclipsed natural sales is a major milestone for the organic industry, and given growth rates, organic sales is likely to far surpass natural product sales in the next few years. 2. Dietary supplements are the second largest category, contributing approximately 10 percent of the total LOHAS market value. 3. Natural and organic personal care products; integrative, complementary and alternative medicine therapies; and mind/body/spirit products and services (containing health clubs, fitness equipment, yoga, self-improvement products and services, natural/organic spas, and magazine, book, video tape, and DVD sales and rentals) round out this category, with a combined value of $72 billion. Green Building is the second largest sector, and contributed nearly $50 billion to the LOHAS consumer marketplace. Its size is driven primarily by purchases of Energy Star certified homes, wh ich is more than half of the sector’s value. Sales of other types of green homes, Energy Star certified appliances, flooring, solar panels, and recycled decking were also included in this sector. Sales of Energy Star certified appliances, approximately $14 billion, were the largest of these. Eco-tourism sales, a particularly on-trend travel option in today’s market, amounted to $24 billion in 2005. These types of trips are growing as much as 34 percent per year, and there are significant opportunities to capitalize on this trend and broaden travel to include an array of experiences from spa services to canopy walks to cultural experiences. Many consumers continue to seek a sense of meaning from their purchases, and eco-tourism is in a unique position to deliver this benefit in multiple dimensions. Natural Lifestyles, a sector that includes indoor and outdoor furnishings, social change philanthropy, and apparel, represented $10.6 billion in sales, or nearly 5 percent of the LOHAS marketplace. The largest sales came from recycled paper products, contributing nearly half of the sector’s value, followed distantly by natural and organic gardening (approximately $2.3 billion). CFLs (Compact Fluorescent Light Bulbs) are also included in this sector. In 2005, their sales were less than $300 million. However, merchandising activities by retailers such as Wal-Mart and Home Depot have significantly grown this category. The number of consumers purchasing CFLs has grown 17 percent annually since 2003. Many other products included in this sector, such as natural cleaning products, organic flowers, and natural pet products, were relatively niche products in 2005. While many of these products have been in-market for many years, new brands such as Method, Pet Promise, and Greenworks are revitalizing these market sectors; time will tell if these brands are strong enough to make a significant contribution to the total LOHAS market size. Alternative Transportation, the fifth sector, includes sales of hybrid cars, car-sharing programs, and biodiesel fuel. At $5.8 billion, sales of hybrids contributed 95 percent of this sector’s value. With the proliferation of hybrid gas/electric engines, alternative fuels, car sharing, and other green types of green cars (such as components made of recycled content), this sector also shows significant potential to be a larger player in the overall LOHAS marketplace. Alternative and Renewable Power sales to consumers equaled $380 million. The commercial market for renewable power appears to hold considerable potential, and consumer momentum continues to build. Barriers in understanding, perception and benefits, as well as perceived complications in switching to renewables will need to be overcome for consumers to embrace renewable power. Finally, total consumer funds under socially responsible investment management in 2005 were $215 billion. Nearly five of every six of these dollars is invested in a socially screened mutual fund. Separate accounts, managed on a custom basis for an individual, is the second most common type of investment but is relatively small: $17 billion. Banks, credit unions and loan funds complete the sector, with $29 billion under management in 2005. The value of these investments is not included in the total market size, because of fluctuating volume based on market performance and their being investments rather than sales. That said, they are clearly part of the LOHAS lifestyle and marketplace. As products rooted in the LOHAS lifestyle become more appealing to mainstream consumers, all of these sectors appear poised for above-average growth rates. Understanding the specific drivers that make a LOHAS product appeal to a mainstream consumer will be critical to realizing this success. Simultaneously, the ever-demanding LOHAS consumer will be looking for new and innovative green products that provide them with the feeling that they are truly leaders in the marketplace. Consequently, we continue to believe the marketplace holds abundant opportunities and deserving of additional investment and attention. Picture: Purchased from reliable Stock Image source. Plant Based Oil: Hemp With Its Increasing Interest, Why? Hempseed oil has a very interesting polyunsaturated fatty acid composition, Fernández-Arche told Reuters Health in an e-mail, because it has an optimal omega-6 to omega-3 ratio of about 3 to 1. Her main area of research is natural products and the bioactive compounds they contain. The researchers examined the fatty acid profile of hempseed oil and found that polyunsaturated fatty acids (PUFAs) made up about 75% of the oil. PUFAs include omega-6 and omega-3, the fatty acids found in some meats as well as flax and fish oils. Hemp oil the popularity growth is obvious. Rich, nutty and delicate in flavour, this oil contains the only naturally-occurring and perfectly balanced nutritional balance of Essential Fatty Acids, Omega 6 and Omega 3. Hempseed oil is just now coming on the market and supersedes all existing oils that have been used to obtain EFAs in the past (i.e. flax seed oil, evening primrose oil and borage oil) – what’s more, it’s the first delicious edible oil to accomplish this. The human body uses fatty acids from food for building tissues and for specialized functions such as the production of prostaglandins, localised tissue hormones. One major group of fatty acids is called essential fatty acids, which are polyunsaturated, and include two major groups, omega-3 and omega-6 fatty acids. They are called “essential” because the body cannot make them and thus, must obtain them from food sources. Hemp seed oil is the only edible seed oil to contain over 80% polyunsaturated EFA’s and boasts not only the optimum ratio of Omega 3 and Omega 6, but also GLA and SDA. What is the ‘optimum Omega ratio’ all about? Research data suggests that the optimum ratio of omega 6 to omega 3 for the ultimate human health ranges from 3:1 to 5:1. The World Health Organisation (Sweden/Japan) recognises this optimum ratio to be 3:1. Studies in western populations today show that a typical diet has a ratio range of 10:1 to 20:1. It is likely that excess refined foods, dairy and a lack of whole foods have contributed to this lack of balance, and in turn, our failing health. Through adjusting our diet to allow more natural intake of these EFA’s, we can improve our cellular health and maximize long-term vitality. Omega-3 oils have been shown in hundreds of studies to lower triglycerides and cholesterol levels – they are also effective in decreasing blood pressure, platelet stickiness and fibrinogen levels. Numerous studies have shown that the substitution of polyunsaturated fats for saturated fats can reduce the risk of sudden cardiac arrest and high blood cholesterol levels. Research has found that for every 1% increase in omega-3, there was a 5mm Hg decrease in systolic, diastolic and mean blood pressure. These EFA’s, especially GLA, have also been found beneficial in both treating and offering protection against various cancers. Key fatty acids found in hemp seed oil provide long-term support and maintenance of arthritic conditions, including rheumatoid arthritis. All these benefits leading topics of today’s lifestyle & health challenges makes this plant based oil seed well worth its topic of new information that is paramount to our answers in use of Omega fatty Acids. And, that the omega fatty acids industry is a great business to be in, as this industry is consistently growing. The crop is still an infant food industry in North America, after being legalized and adequately regulated in the late-1990s. However, it is appearing in an increasing number of human food and nutritional products. Uduslivaia said hemp is well-positioned to grow. Hemp protein, pea protein and brown rice protein have found a growing demand in the protein products area, which was once dominated by men and weight lifters. The revival of protein as a positive food element has allowed its market to expand beyond muscle-focused men to include young, health-conscious women.